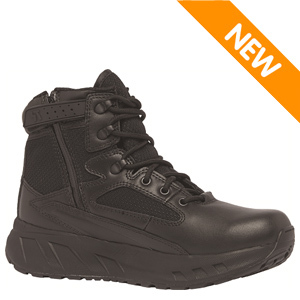 Designed specifically for law enforcement professionals who are on their feet all day, the Tactical Research MAXX 6Z Maximalist Men's 6in Black Tactical Boot takes comfort to an extreme level. The number one compliant of public service professionals in their footwear is lack of cushioning. The folks at Belleville responded with the MAXX series boots which are ultra-cushioned with a full 29mm of heel padding to provide maximum comfort on the heel and ball of the foot. Additional padding reduces shock to your feet and joints by an estimated 25%-55%. In addition, the midsole design incorporates a "rocker" geometry which attenuates more shock and encourages a smooth rolling motion of the heel to the toe when taking a step. A convenient side zipper makes for easy wear and removal after long duty shifts and. A 6 inch above the ankle height provides excellent support and protection while still allowing for movement and cooling.